SEN SOIRÉE is a brand new concept, which brings together business people and emerging artists at an exclusive crypto artwork gallery exhibition. Through a collaborative approach, we’re growing an ecosystem where creative minds, tech professionals and business leaders come together to experience the newest kit, see innovation up close, share knowledge and create new partnerships that help their businesses grow. We provide unique experiences that surprise and allow visitors to see things from new perspectives. Showcasing EU emerging artists and EU startups at the Cibeles Post Office Madrid until 29 April. Exhibition open and free for everyone. Address: Paseo del Prado, 1, Madrid. BE PART OF THE EXHIBITION THAT EVERYONE WANTS TO VISIT! SOIRÉE, is a French word. Soir means “evening”. An elegant evening party to celebrate the opening of a gallery. SEN SOIRÉE (WWW.SOIR.EE), is a brand new concept made in Europe, which bringstogether business people and emerging artists at an exclusive cryptoartwork gallery exhibition. Our work includes from the creativity the design and production of the artwork up to his later edition in a physical crypto gallery, planning the whole calendar of exhibitions, as well as the maintenance and promotion. WWW.SOIR.EE concept is based on the principle that the arts are transformative for individuals and communities. 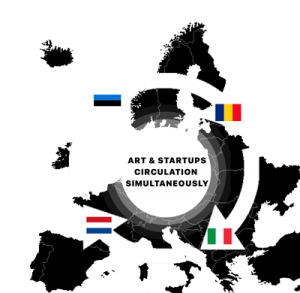 This belief simultaneously serves to promote the European emerging artists and new entrepreneurs by providing a futuristic tool for cultural expression, drawing on the art to showcase a constructive vision of the future of Europe via local and international collaborations. The idea is to revolutionize the formula to throw, to promote and to produce new entrepreneurs and emerging artist, extracting the maximum departed from their talent, transforming it into attractive content for the visitors. SEN SOIR.EE 1960 is one of the stops of a large European project presenting 12 EU emerging artists and EU startups from European countries. The idea of collectives presentations originated in Brussels (Belgium) in 2017 as a special photo exhibition mixed with innovative startups in commemoration of the 60th anniversary of the Treaty of Rome. and for the first time, it was realized in the form of a touring exhibition in 2018. Today the exhibition has a form of a biennial organised on a regular basis in cooperation with art & entrepreneurship institutions and cultural communities. A Modern format created by European Millennials aiming to recognize inspirational entrepreneurs and emerging artists. They are individuals who are creating value and leaving lasting footprints in Europe. As a result of the search for convergence between the culture of entrepreneurship and artistic education, the fourth edition of SEN SOIR.EE 1960, a revolutionary and innovative photographic exhibition that opened on Thursday, April 4, arrives at the Cibeles Post Office. On this occasion, the exhibition has the collaboration of CorreosLabs, Startup Europe and Startup Europe News (SEN) and Nefercity System. SEN SOIR.EE brings a sample of 12 experiences from different European cities covering topics such as environment, energy, medicine, robotics and many more. CryptoArt are rare digital artworks, sometimes described as digital trading cards or “rares”, associated with unique and provably rare tokens that exist on the blockchain.offering a practical solution to issues regarding copyright, ownership, and authenticity, problems faced in the art industry. At WWW.SOIR.EE crypto-artwork gallery exhibition. The details of the project and the story behind the artwork can be accessed through a QR-code and a radio-frequency identification chip (RFID). European Commissioner for Single Market, Industry, Entrepreneurship. READY FOR A SEN SOIRÉE EXHIBITION IN YOUR CITY / ORGANIZATION?